We want to say a big thank you for all you have done over the last few years for Bassetlaw Food Bank. We have had a few changes at Bassetlaw Food Bank over the last few months. Allison Palmer has left us as Co-ordinator to go onto BCVS full time but is still volunteering with us when she can. Carol Freeman has now been appointed the new Co-ordinator after being a volunteer at Retford for a while then assistant co-ordinator. She is looking forward to the new challenges and working with all the volunteers at both Worksop and Retford. Claire Flint has now joined the team as assistant co-ordinator. She brings new skills to work alongside Carol and help the people of Bassetlaw within the food bank. Jean Coulson is still the Chair of Bassetlaw Food Bank and we are thankful for all she does for us, along with the rest of the Trustees. We have a wonderful team of volunteers who help us each week at both the centres in Retford and Worksop and we couldn’t run the food bank without them. THANK YOU FOR YOUR CONTINUED SUPPORT TO KEEP BASSETLAW FOOD BANK OPEN. 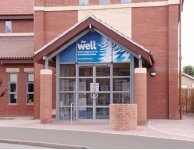 Thank you to everyone at The Well in Retford, for all the donations you have given to Bassetlaw Food Bank over the years. Your help has been amazing and really appreciated. With Harvest Festivals coming up we so appreciate donations coming in from schools, churches and organisations. We are currently short of the following items. Please help if you are able. Or LIKE us on Face Book Bassetlaw Foodbank where we post on a regular basis items we are short of. Would you like to make a cash donation to support the work of the Bassetlaw Food Bank, either as a one off donation or on a more regular basis? A Big Thank – You to all the Businesses, Community Organisations, Churches, Schools and individuals who are regularly supporting the Food Bank. By working together in this way we are helping a huge number of local people who, through no fault of their own, are finding themselves in food poverty.